There is something about the autumn that turns 87% of the population into raging Pumpkin Spice addicts. Now, I love a good pumpkin dish as much as most people, but I don’t go ga-ga over EVERYTHING PUMPKIN!!! 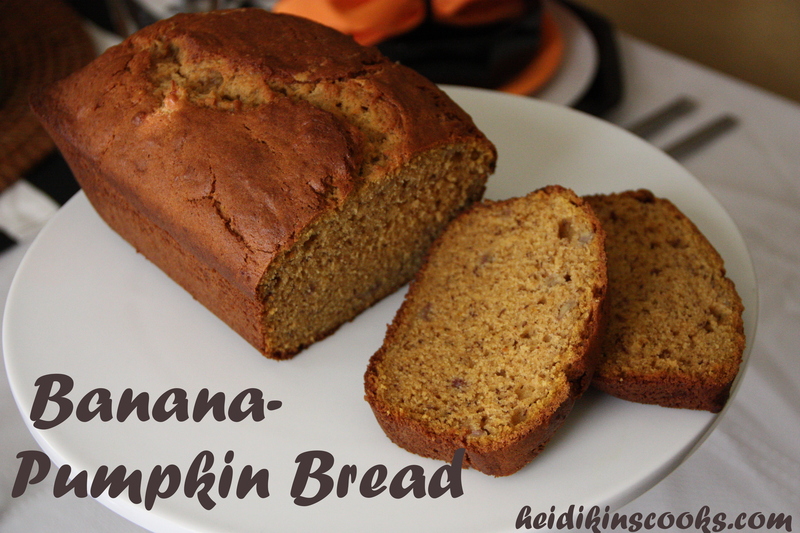 That being said, when the idea for Banana-Pumpkin bread crawled into my head, I couldn’t really dislodge it without some experimentation. The result was a warm-tasting bread that was neither too much banana or really even smacking of pumpkin (if you upped the spices you could probably make it more pumpkin-pie like). This recipe makes two loaves, one of which I gave to a friend and took the other to work for my colleagues. It was completely gone in just a few hours. This bread? This bread is fantastic, ya’ll. Cream butter and sugars until fluffy, add eggs and buttermilk. Add pumpkin, bananas, and vanilla, beat until smooth. Sift dry ingredients together, stir to combine with banana-pumpkin mixture. Pour batter into 2 greased loaf pans. Bake 50-60 minutes or until a knife inserted into the center of the loaf comes out clean. Let cool in pans on wire rack about 10 minutes, then slide butter knife around the loaf and gently turn out, let cool completely. You can also put this mixture into muffin tins, bake about 18 minutes.